Click here to download sample chapters of "DIY Investing Guide To Dividend Stocks (eBook)"
It is always good to start early, whether you’re twenties, thirties or forties. There is still time. So get ready to take control of your financial future and unlock the power of dividend investing—regardless of your age or current situation. 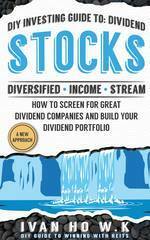 This ebook seeks to provide expert guidance towards finding and investing in unique but conservative and proven dividend stocks.